I’m going to bed smelling like dirt and applesauce. I think that’s a sign of a good day. I suppose I could shower, but I strongly dislike the activity, so I’m going to push that off till tomorrow. Hooray for procrastination! I’m going to bed smelling strange because today I spent with Kate. Kate is a good friend of mine. She has some great stories too! Some will make you laugh (guarnteed) and some might make you cry, but most are for her to share and not me. She tells them best in real life because that’s when you experience her friendly face and perky personality. However, you can also read about a significant part of her life over the last year by clicking HERE to see her blog. We’ve been friends for 14 years this September. We met in Grade 2 when we were both the new girls at school we went to. Along with my cousin KS, we made up the Three Musketeers and had many an escapade worth retelling, but not here and now. Together we’ve had more than a few quests and tales. We’ve sailed a tall ship, canoed the Bowrons, endured soccer runs, traversed high school, felled trees, built fires, slept under the stars and pushed quads out of mud. 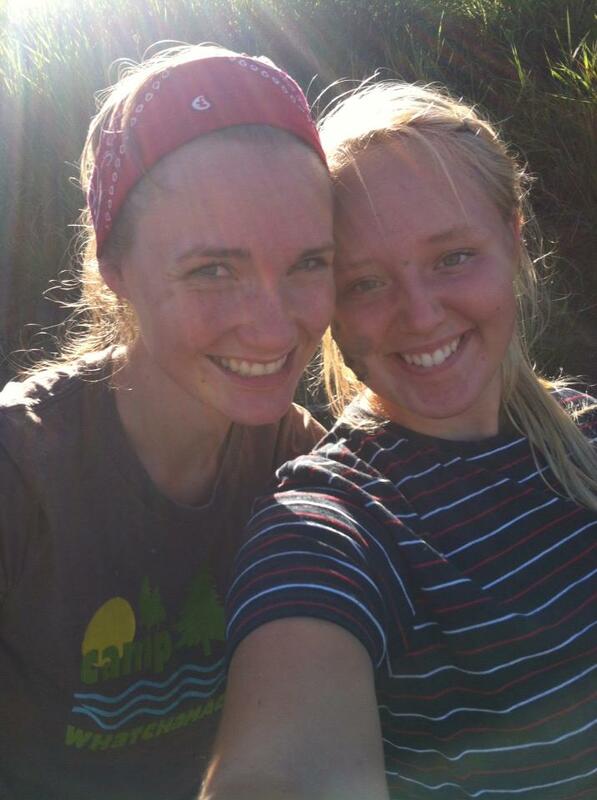 She’s the one I’ve dropped from a bunk bed and dumped in the creek and somehow she still lets me hang out with her! Today, however, we did none of that. *Note: She’s not kneeling. 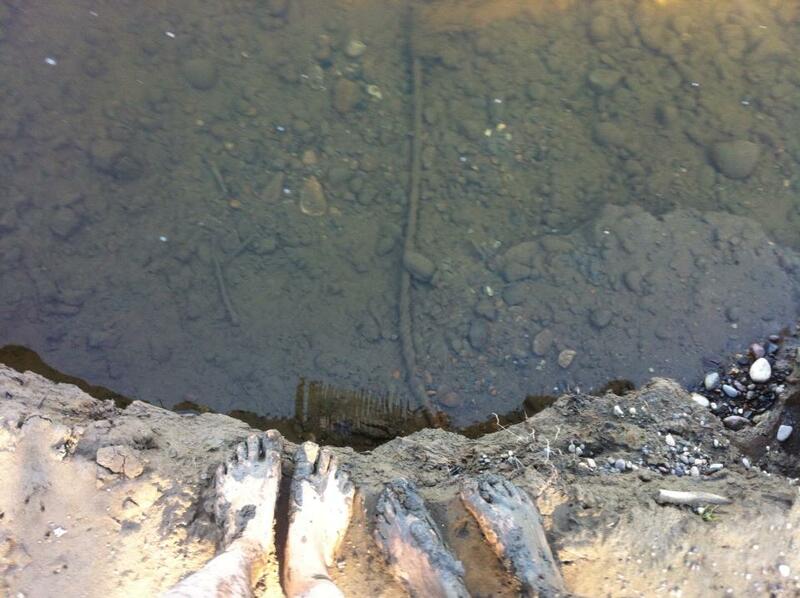 That’s just some thigh-deep mud right there! 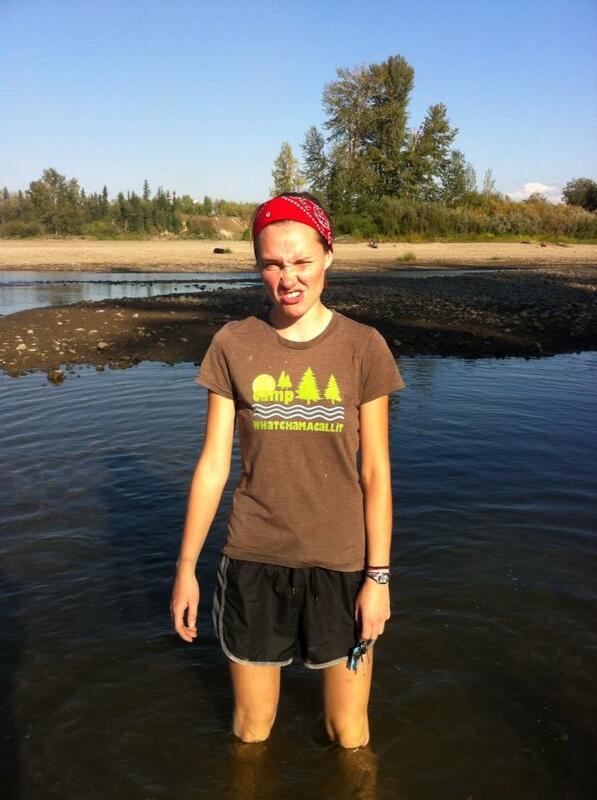 Wait – Credit where credit is due – Kate found a mudhole, and then shared the secret spot with me. It was thrilling. 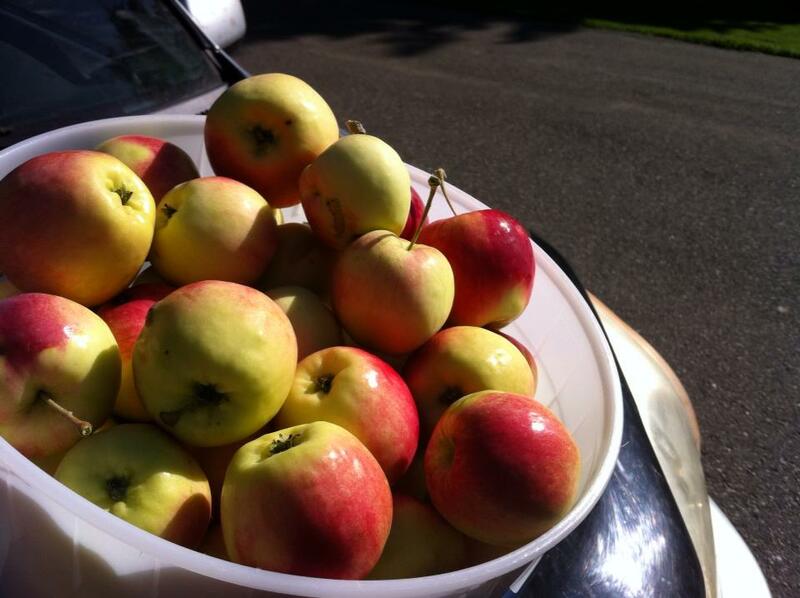 …an afternoon of APPLE PICKING! Oh yes! We pack the activities in on our Saturday afternoons! We like to be productive. That’s one of the things I really like about hanging out with Kate. We work well together, which is a quality I’m learning never to take for granted! 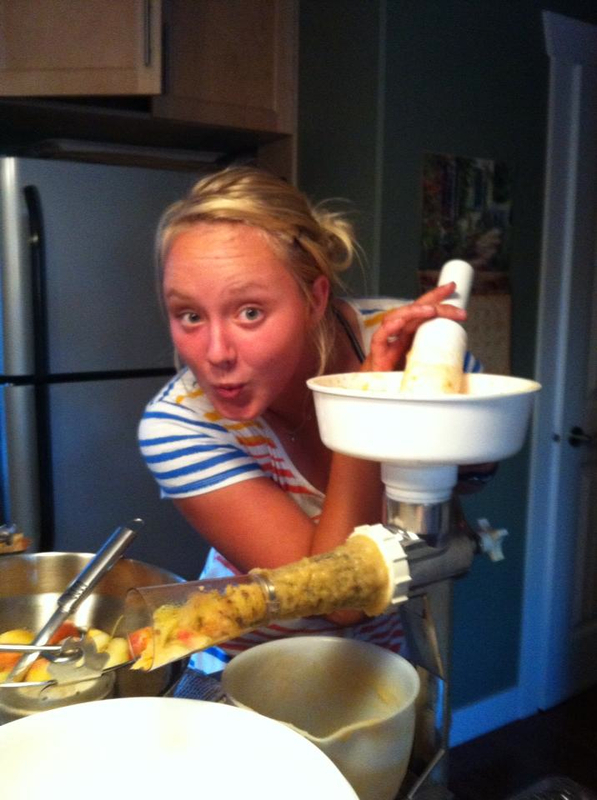 We’re making applesauce. Lots and lots and LOTS of it! I’m looking forward to eating the warm smooshy stuff right after we smush it, but also to the satisfying stocking of our freezer, seeing our efforts turn into something tangible, and the time spent with Kate and anyone else around with a hand to chop, boil, or smoosh. But, why am I really telling you all this? It’s because I value friends. It’s because I know that tomorrow isn’t promised so you better find the mudholes today. I feel like this was a great way to kick off my fall; a new season literally, but also in my life. I’m taking (yes, another) year off school so that I can focus on life. I want to be intentional in connecting with people. I don’t want schoolbook distractions, rather I want to learn to live and love well. Isn’t that more important anyways? Isn’t that kind of what life is about? Loving people? That’s what I want to do. I want to listen, to love, and I want to Be. To breathe and make bread and pick apples and wallow in mud. I’m ready to make some memories. Are you? 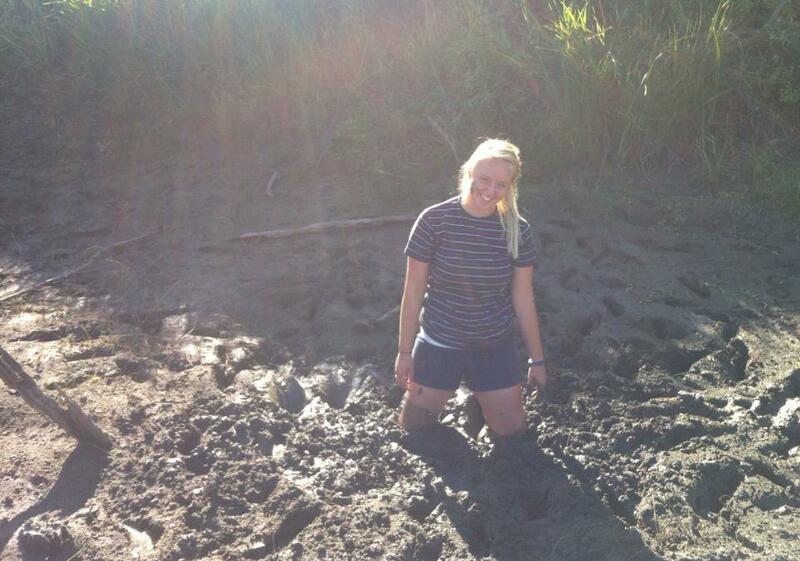 On the way back from the mudhole, we had to walk through gross stagnant river water. Ew! There were green things in there! This photo shows how impressed I am about that. Next Post Photo Friday, on Mudnday. Many, it’s good to have many. Nathan and his friend David used to go to Allison Lake just north of town by 1/2hr and dig into the clay at the side of the lake, then fill with water and throw the clay back and stomp in that ubntil it was incredibly smooth and mooshy and very sticky! Loved this blog my friend! of course all your blogs or so incredibly interesting… what can I say, thanks for being my friend and taking the time to invest in my life! Both brothers and I would do something similar with the garden hose and garden. It entertained us for hours! Thanks for taking the time to keep following my life. I appreciate your friendship as well. It’s not every paint store I can walk into like a drowned rat and stay to chat a while!